CCT Tapes is a fast growing, specialty tape manufacturer with a proven track record of success in providing unique solutions to customer and market needs with unparalleled speed and industry leading quality. CCT Tapes produces a broad portfolio of adhesive tape products, using both acrylic and synthetic rubber adhesives and a wide range of foams, films, and other substrates. Partnering with CCT for your PSA tape needs offers more than having just another supplier. Our products are manufactured and tested in a best in class quality system. We offer significant flexibility in our product offering and order sizes, with customization to meet your needs. Our team will bring creative problem solving and product design abilities, along with speed of response to ensure your deadlines are met. Our close partnerships with our material suppliers allows us to offer unique materials that can help to differentiate your products and enable growth. CCT is an ISO 9001 certified manufacturer and our adhesives testing laboratory is certified to ISO 17025:2005. We pride ourselves in our high quality manufacturing systems. Our goal is to supply custom coated products that meet or exceed all expectations. We meet or exceed all regulations for emissions and waste production. With state of the art environmental controls in our processes, we continually monitor the safety of our operations. CCT is a Responsible Tape Manufacturer (RTM) and member of the Pressure Sensitive Tape Council. RTM is a new initiative that aims to be an indicator of ethical and quality leadership in the tape industry. CCT has made a commitment to ensure that our tape products are produced in a responsible manner, and with consideration for the environment, workers, facilities, and quality systems. CCT Tapes is a member of the Pressure Sensitive Tape Council (PSTC, www.pstc.org), and a certified Responsible Tape Manufacturer. The program, certifies tape producers that have sustainable best practices in environmental, manufacturing safety and health, and quality control standards. You can find out more about the program at pstc.org/RTM. 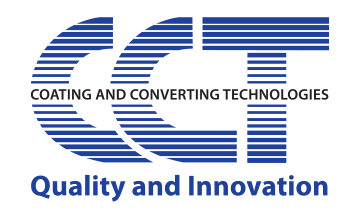 CCT is also a member of AIMCAL, the Association of International Metallizers, Coaters and Laminators (www.aimcal.org) and the Gasket Fabricators Association (www.gasketfab.com).